Unikitty’s tail as Superman’s spit curl is an inspired move. Making their debut at San Diego Comic-Con next week and going wide in 2017, Lego BrickHeadz Marvel and DC buildable figures are freakishly adorable. Earlier this year, Mattel’s Mega Bloks introduced a series of buildable pop culture figures called Kubros, that are fun to build but kind of ugly. Lego’s answer to Kubros is BrickHeadz, a similar concept, only they are just plain lovable. Look at Captain America’s eyes. Just look at them. It’s a combination of the round (or square, in Iron Man’s case) eyes and the high foreheads. Throw in a side of little claw grippy hands, and you’ve got some endearing little guys. 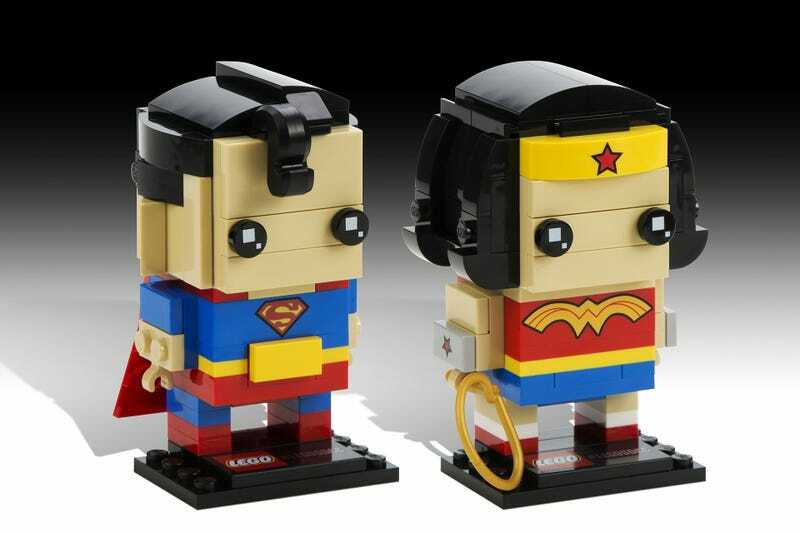 Lego is launching four two-packs of BrickHeadz at San Diego Comic-Con, each featuring a pair of DC or Marvel characters. In order for fans to get their hands on one of the $40 sets, they’ll have to get up early in the morning and participate in a random drawing for a chance to purchase things. When feel bad about missing the show this year, I think of stupid things like that. Oh. My. God. I. Need. Black. Panther. These four sets won’t be offered anywhere else, so once they’re gone it’s wait until the line launches at retail in 2017 and hope for the best. I wish io9's Evan Narcisse all the luck scoring a Doctor Strange and Black Panther set at the show. Maybe get two.